The next few posts are for those who saw me speaking at the most recent CRMUG UK Chapter meeting about Fiddler2 and wanted to know more (and as a thank you to those who voted for me in X(rm) factor!). I've been using Fiddler for web debugging for as long as I can remember and I can honestly say that I could not live without it when Developing Dynamics CRM extensions as well as supporting and diagnosing issues with existing solutions. I first blogged about it in connection with SparkleXRM development but this post elaborates further on the super powers it gives you! 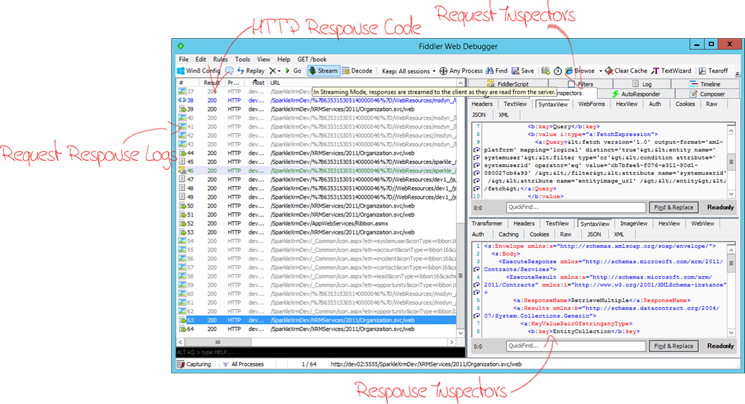 What is a Web Debugger? Fiddler2 is a Web Debugger which basically means that it sits between your browser and the server just like any normal proxy, but the difference is that it shows you all the HTTP traffic going back and forwards, allows you to visualise it in an easy to read format as well as allowing you to 'Fiddler' with it – hence the name. You can easily install fiddler for free by downloading it from http://www.telerik.com/fiddler. The following posts describe the superpowers that Fiddler can give you whilst you are developing solutions or supporting your end users. Ask the user experiencing the issue to install Fiddler2 (this may require administrator privileges if their workstation is locked down). Get to the point where they can reproduce the problem – just before they click the button or run the query, or whatever! Ask the user to click File->Save->All Sessions and send you the file. Once you've got the file you can load it into your own copy of Fiddler to diagnose the issue. Now you can load this file into fiddler using File->Import Sessions->IE's F12 NetXML format file. This technique is going to save you lots of time when trying to work out what is going on over the phone to your users!